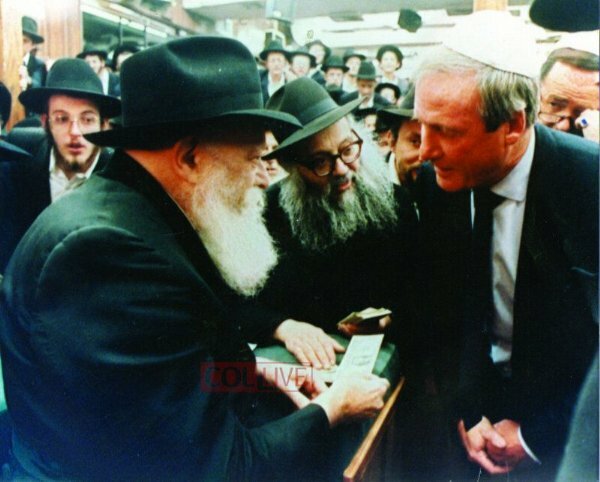 Chabad Telethon Producer Dies Jerry Weintraub, a legendary American film producer who was proud of his Jewish heritage and a champion of Chabad causes, passed away on Monday, 19 Tammuz 5775. He was 77 and passed away after suffering a heart attack. Just a few weeks ago, on June 19, Weintraub was a guest speaker at a Friday night Shabbos dinner at Chabad of Malibu in commemoration of the Rebbe's yartzeit on Gimmel Tammuz. Malibu Shliach Rabbi Levi Cunin told COLlive.com that it was a sold-out event and that Weintraub mesmerized the crowd with his tales and the description of his love towards the Rebbe and his Shluchim. Weintraub was born to a Jewish family in Brooklyn and raised in The Bronx. After working at a record label, he left and formed his own music promotion company. He later turned to movies and reached the position of chairman and CEO of the United Artists film and television entertainment company. In his autobiography, "When I Stop Talking, You'll Know I'm Dead: Useful Stories From A Persuasive Man," he describes the close bond he felt towards the Rebbe. In fact, the photograph hanging over his bed in his Beverly Hills mansion is of the Rebbe. Weintraub said he was watching television late one night when the Rebbe came on the screen and seemed to be speaking directly to him. His connection with Chabad began when the Chabad House in Westwood was burned down in a fire that was started by a neo-Nazi group and California's Head Shliach Rabbi Shlomo Cuninsought his help in rebuilding it. "It didn't make me become Lubavitcher or Orthodox, (but) I started to work with them," Weintraub said. "And when I was brought to Brooklyn to meet the Rebbe, it was eye-opening. It was amazing." He said that when the Rebbe walked in, "everything stopped. The room parted. He walked through the room and when he got to the front, I was brought up to meet him. I saw his face and I thought, this is the most G-dly face I've ever seen. He was peaceful, serene. I said to myself, 'This is as close as I'm ever going to get to God.'" Weintraub was one of the most influential and successful people in the entertainment industry, with a career spanning more than 50 years. In addition to his professional endeavors, he was known for his philanthropic efforts, ranging from health concerns to education to the arts and more. Weintraub joined the Chabad Telethon in 1984, just 4 years after the annual televised fundraiser show for Chabad of the West Cost was founded. He has served as its co-chairman ever since, helping the show attract actors, musicians, community leaders and concerned citizens. "I do think and believe and know that the programs we've done at Chabad --the drug program, the food program, the schools-- everything we've done over the last 29 years has made this community work," he said in an interview. "Sarah Cunin and I, and all of us in the Malibu community extend our heartfelt condolences to the entire Weintraub family," RabbiLevi Cunin wrote to COLlive in a statement. "We are all shocked by the sudden passing of Mr. Weintraub. Besides all of the many great things he was, Jerry was to me a dear personal friend and I will miss him greatly. "Our prayers are with Michael Weintraub, Jamie Cee Weintrauband the whole family. Our final Chassidic embrace, just a few weeks ago here at Chabad will remain with me, forever. Rest in peace my friend."